MÉSOFORCE MAT draws inspiration from mesotherapy to visibly revitalize skin. Its light cream-gel texture, specially formulated for combination to oily skin types, combines a skin purifying complex with a cocktail of vitamins and hyaluronic acid to moisturize and matify skin. In 1 month*, pores are less visible, skin appears visibly revitalized, smoothed, and less fatigued. *Scientific and satisfaction tests on 33 women, twice-daily application. VITAMIN B5: Skin hydration is enhanced, skin is protected. 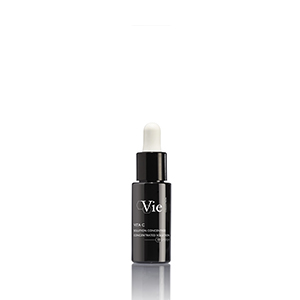 VITAMIN C: Skin is smoothed, the complexion is brightened and revived. VITAMIN E + COENZYME Q10: Skin is protected, skin aging is slowed down. A bi-vectored active ingredient comprising amino acid and glycine grafted to a fatty acid. This multi-purpose dermo-purifying complex targets all causes of skin imbalances. Results: Skin is cleansed and free from imperfections. *Clinical test carried out on 33 women. **Forehead sebum excretion levels measured with a Sebumeter. *Satisfaction test on 33 women who applied Mesoforce Mat twice a day for 28 days. MÉSOFORCE’s tangy, energizing scent has crisp notes of citrus that are balanced out by the feminine fragrance of jasmine flowers. AQUA (WATER) / EAU, CAPRYLIC/CAPRIC TRIGLYCERIDE, COCO-CAPRYLATE/CAPRATE, ISOSTEARYL ALCOHOL, CORYLUS AVELLANA (HAZELNUT) SEED OIL, BUTYLENE GLYCOL COCOATE, DIPROPYLENE GLYCOL, CAPRYLOYL GLYCINE, PANTHENOL, SILICA, PHENOXYETHANOL, HEXYLENE GLYCOL, ACRYLATES/C10-30 ALKYL ACRYLATE CROSSPOLYMER, GLYCERIN, PARFUM (FRAGRANCE), SARCOSINE, SUCROSE PALMITATE, XANTHAN GUM, SODIUM HYDROXIDE, CINNAMOMUM ZEYLANICUM BARK EXTRACT, ETHYLCELLULOSE, TETRAHEXYLDECYL ASCORBATE, O-CYMEN-5-OL, SODIUM HYALURONATE, GLYCERYL LINOLEATE, TOCOPHERYL ACETATE, TOCOPHEROL, UBIQUINONE, LECITHIN, SACCHARIDE ISOMERATE, CITRIC ACID, HELIANTHUS ANNUUS (SUNFLOWER) SEED OIL, POTASSIUM SORBATE, OLUS (VEGETABLE) OIL / HUILE VEGETALE, ASCORBYL TETRAISOPALMITATE, SODIUM BENZOATE, LIMONENE.